To help you understand what the chart is reporting, below is a brief explanation of what the two bars represent for the Monkey. The Monkey is more oriented to the first preference for perceiving. That is, a preference for perceiving facts and details, real and tangible things, in one’s environment. This preference is common for both Monkeys and Labradors. This is why the top bar for each of these animals will be the same. The bottom bar is looking at how a person prefers to manage themselves and their environment. There are two core preferences for “managing” being considered here. The first is a preference to be orderly and structured. The second is a preference to be flexible and spontaneous. The Monkey is more oriented to the second preference for “managing”. That is, a preference for being spontaneous and flexible. In some ways, it is this preference which makes them great tacticians. 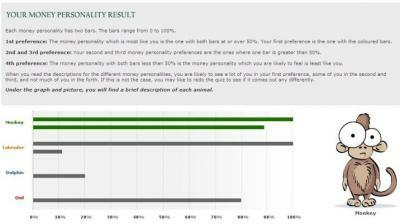 Each preference alone is interesting, however, by combining the two preferences we start to see the Monkey preferences. Read more about the Monkey preference here.